CNC Machined from solid Billet Aluminum! Our hot new Billet Levers replace your stock levers on the following Touring Models: 2014-16 FLHT, FLTRX, FLHX with Hydraulic Clutch. Choice of Super-durable Black Anodize finish or Triple Chrome. 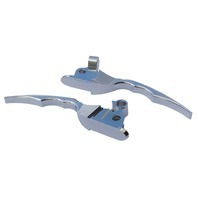 These levers require the use of your stock plastic bushings and all stock parts on the stock levers. Just swap these parts over when you install our levers.